As a first year senior riding for Team Raleigh GAC, it’s all been a bit of a shock to the system. Being part of a UCI continental team takes your cycling up to a different level. 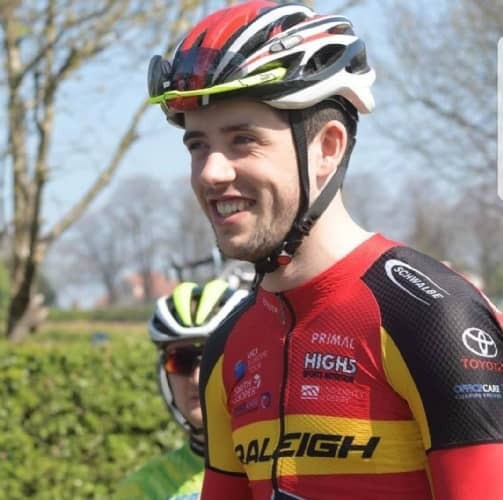 I had sent my CV to Cherie Pridham, the DS of Raleigh GAC towards the end of last year, I had some decent results early season and I was 12th in Kuurne Brussels Kuurne Juniors last February which brought me initially to her attention. I met her again after winning the 1878 cup in London, at the time I had no firm club to ride for and when she asked if I would like to ride for Raleigh GAC with my brother Fraser, I jumped at the chance. WE raced together at Perth Utd CC, and Spokes RT and always supported each other. Raleigh GAC is based in Derby, and my first trip down to meet my new team mates was a bit nerve wracking. I had Fraser with me to share the drive so that helped. I was always supported massively at Spokes RT (thanks Craig & Blair) but the official kit day in Derby was a little bit different, I had an idea of what to expect, but when the kit was handed out, wow! After a few attempts we managed to pack the car for the journey home. It makes you think, if somebody is prepared to invest in you, you should be prepared to give it back on the bike. Next it was time for the team ride and oh it was tough considering I’d raced the day before. Adam Kenway decided to pick a hilly route. Surprise, surprise the National hill climb champion picks a hilly route! At my first race with the team (Klondike GP) I was impressed yet again by the professional set up. The campervan, two team cars, the van and all our Raleigh bikes lined up on display. This was also the first time I met all the incredible staff. They all work so hard and do everything they can to help us achieve the best possible which I really appreciate! Now time to move onto the racing! So far I have competed in all the Spring Cup Series races and a few of the Tour Series events which have all been really tough! I’ll save my tour series experience for another blog. People always told me the jump from youth A racing to junior racing is the hardest but the jump from junior to elite senior British racing is, in my opinion, 10x harder! The races are longer, the competition harder and in general the terrain is tougher. However, my experience’s racing junior UCI events meant I was able to cope easily with the bunch racing. At this level, the riders respect each other more in the bunch compared to junior racing were everyone was racing for the win and there were too many willing to take unnecessary risks. At these races, I’m not there to win, I’m there to help. So far at this level I’ve been fetching bottles, following breakaways and simply positioning myself at the front of the race around my team so that I’m there to help when they need me. The night before every race we have a team discussion and a plan for the next day which although might not always work out, we at least know our roles in the team. After the race we have a de-brief where we analyse our performances and think about future plans where we can make improvements. From every race so far I have come away learning something new whether I’ve learned it from my team mates, my boss (Cherie Pridham), my coach (James McCallum) or simply from the experience. I feel so lucky to be where I am at the moment with all this experience and support around me. Throughout the races I have guys like Enrique Sanz who rode for 5 years with Movistar and Yoeri Havik, a world class 6 day rider, talking me through races and teaching me as I go. Being the youngest on the team is great because everyone is so supportive and I’m so grateful and thankful to be in this situation. Thank you for reading.